Sanju Pariyar is another child who had the misfortune of being born in a family of tailors, a Dalit and therefore an untouchable. As if that wan’t enough, her dad is a drunk and mom suffers from a heart condition. Consequently, her family struggles to cover her educational expenses. 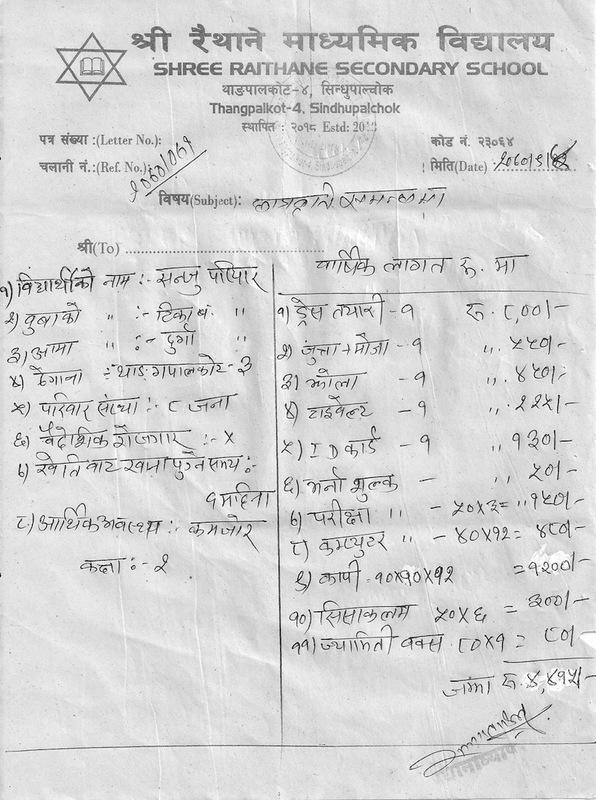 Attached below are details of her family and the cost of her education. At the current rate of exchange of approximately Rs. 98=US$1.00, the total cost amounts to US$45/year as 2nd grader. However, she has just four more months in 2nd grade. Academic year in Nepal runs from mid-April to the beginning of April the following year. That means, she’ll need support for at least the next seven years. Purchases by Nemira Customers 35 – 47 has ensured that Sanju gets to finish school! Sanju has passed her exams and has moved on to grade 3! Details of her educational costs for the 2014-15 (2071) academic year can be found here. Sanju has passed her exams and has moved on to grade 4! Details of her educational costs for the 2014-15 (2071) academic year can be found here. The earthquake of April 25, killed her father as well as the only livestock they owned — two goats — and destroyed her family house. It’s been almost two years since the last update. Following the devastation the earthquake wrought on her family, had still Sanju managed to stay in school, she would have been in grade 6. She was not. In the academic year 2016-17 (2073) she eloped! She currently still lives somewhere in Sindhupalchok with her new family.